(Spoiler Alert) Both trails require the essentials. I finished the Appalachian Trail (AT) in mid December, 2015. Hoarfrost glazed the landscape, icicles lined the slick, frosty trail, and a damp, east coast chill seeped through ever layer I wore. It was time to be done, though it wouldn’t be for long. A few months later, when the feeling in my toes had returned, and my hiker hobble lessened, I headed for the Pacific Crest Trail (PCT). I was confident in the hiking part, but was uncertain about how my gear setup would have to be altered. 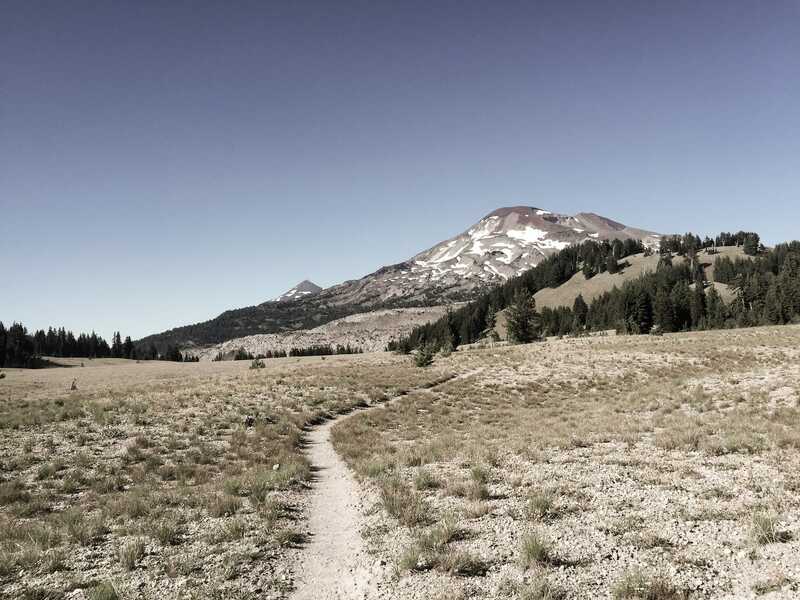 Unlike the AT, the PCT sees diversity: desert, high mountain passes, hot, barren lava fields, and temperate rainforests. Despite this, the core of my gear didn’t change much. I swapped out rain gear for a sun umbrella & upped my water carrying capacity by 3 liters. I reasoned that my long underwear and puffy jacket would be perfect for the cool desert nights and once I got into the mountains I could resort to sleeping with hot water bottles when it got cold. Besides, by that time I would be carrying a bear canister and wouldn’t have the space for more gear. I had to find ways to work with what I had. I started walking in early April thinking that I had outsmarted the worst of the desert heat. That’s what everyone talked about. Sunburn is unavoidable, your lungs will scorch from the stupefying midday Mojave heat, dehydration, and hallucinations to follow. By starting earlier I thought the Desert Fear Tornado wouldn’t be relevant. But, as I quickly learned the desert knows no limits, and she wont let you forget. The first week, while taking refuge under my sun umbrella I watched it rain, hail, and turn people hypothermic. When that subsided, the wind took over. Now I hiked with dry, cracked lips, sand grinding between my teeth, and bloodshot eyes from fighting against the wind that relentlessly tried to whip me back to wherever I came from. Almost right away, I found that the sand that trickled into my shoes throughout the day, had ground holes through my socks. I only had two pairs for hiking. On the AT, a pair of socks would last me a least a few hundred miles, out here I might as well have gone barefoot. I didn’t plan for any of that but, that’s thru hiking. A day never passed that I didn’t contemplate what I was carrying on my back, always asking myself was there a better, more efficient way, to strip grams/ounces/pounds? I cut straps, pulled out the aluminum stays in my Southwest pack, replaced my Aqua Mira with bleach, got a tiny Swiss army multi tool in place of my large serrated knife, and removed any item that I didn’t use on an almost daily basis. I even mused whether or not deleting music off my iPod would make it any lighter. I often think of Napoleon, a trail mongrel, an apparition of sorts showing up when you’d least expect it “everything in my pack has EARNED its RIGHT to be there” he growled once and I muffled a laugh looking at his brand new used pack bursting at the seams from his hiker box collection. He had a point, though. I carried a lot of the same things that I finished the AT with. It was like having insurance, my gear had proven time and again that it belonged with me and would get me to where I needed to go. I made it to Kennedy Meadows ‘the Gateway to the Sierras’ in mid May. Few hikers were venturing past here. News of helicopter rescues, snow up your neck, and exit strategies swirled amongst us. No thru hikers had gone all the way through yet. I spent the night, considered my options, and with the hope that I’d catch up to whomever was in front of me, left the next morning. A few days later I met and proceeded to spend the remaining 1900 miles traveling with three diverse hikers. Moaglee and Goliath had north bounded the AT in 2014 and Stick, new to the trail community but who evolved into the most lightweight and minimalist of us all. 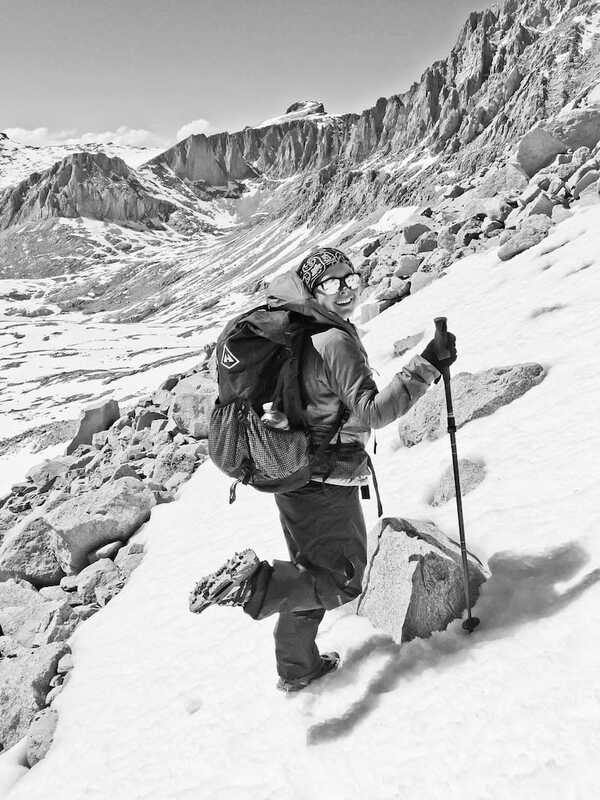 We all had our own hiking styles and it exposed me to ideas that I would have otherwise overlooked. I liked how Goliath used a tarp and carried a separate piece of bug netting that he would pitch over his poles, crossed above his head when the mosquitoes plagued us. It was light-weight, simple, and bombproof. Stick mutilated his pack, got rid of his stove, and ate mostly peanut butter insisting that x spoonfuls per x meals provided him with all the necessary calories. However, what stuck with me most was when Moaglee pointed out that gear is only half the battle and hikers should pay more attention to their food and water. Understanding how far apart your water sources are, and really dialing in the days between resupply could cut your weight significantly. It never dawned on me until then that I rarely walked into town without a few extra days of heavy food. It’s one thing to carry that extra meal just in case and another thing to be careless. I watched him do 15+ mile water carrys on one liter of water by cameling up at every water source prior then waiting until the heat of the day had passed. My trail family reminded me often that there is more then one way to accomplish the same goal. Now with two long trails under my feet you’d think I’d have a good idea of how I’m going to tackle the Continental Divide Trail (CDT) and yet as I scan through other hiker’s gear lists I can’t help but to question my own. On the AT I carried a 34 liter pack only because it was a worn in pack that I trusted. I was a complete novice, not ultralight, but it forced me to look carefully at what I was packing. Looking back I realize how having that kind of space limitation molded the mindset that I have towards long trails and traveling in general. It taught me about how little I need to be comfortable and happy regardless of environmental conditions. Moaglee often talked about how important it is to bring only the bare necessities. You can’t plan for the endless what-ifs, and it’s exhausting trying to do so. When you have just what you need you allow for a deeper connection to the trail, making for a more intimate, meditative experience with yourself and your surroundings. Regardless of how many miles I’ve walked there will always be hundreds more ahead and despite what I choose to carry or leave behind it there will always be constant forward progress. 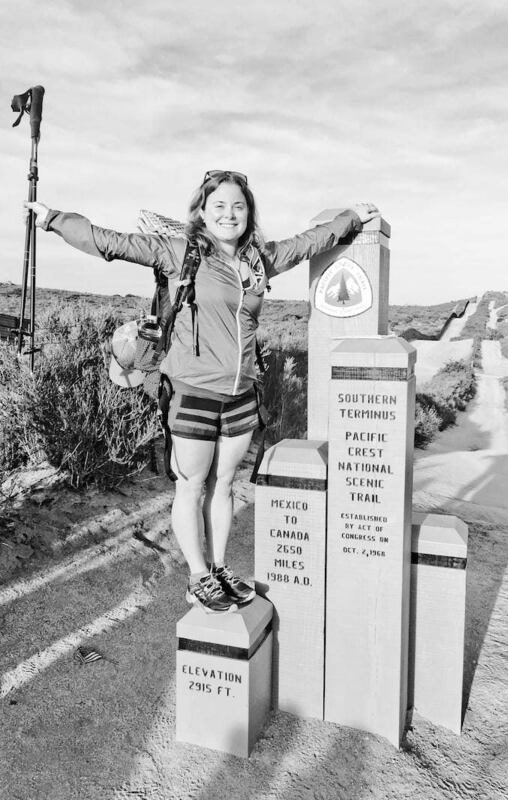 Robin Standish is an accomplished AT & PCT thru hiker who is currently planning her 2017 CDT to earn the Triple Crown of Hiking. 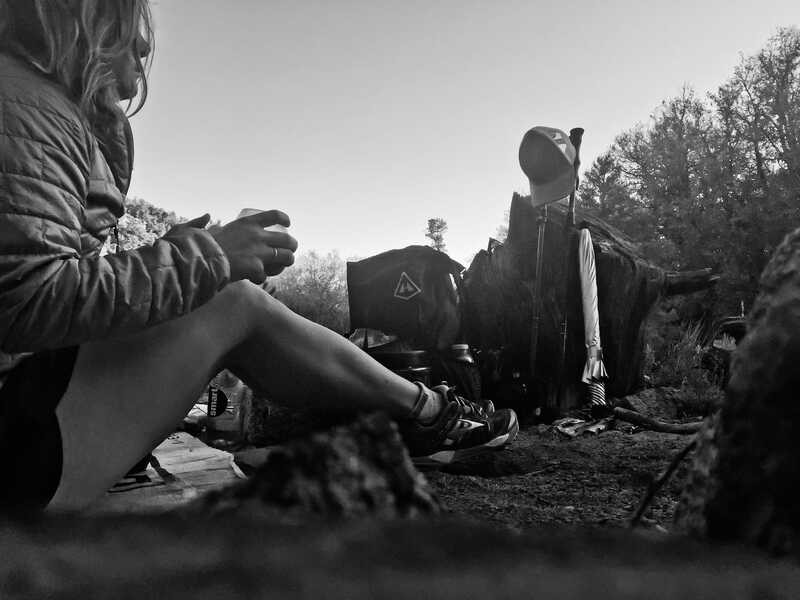 The post From the AT to the PCT: Shifting Gear appeared first on Hyperlite Mountain Gear Blog.